Offering you a complete choice of products which include running track, professional athletic track, pre fabricated running track, athletic running track and athletic track flooring. 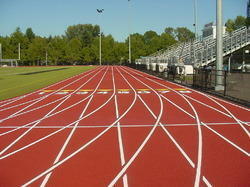 We are offering Running Track, which is available in diverse designs, patterns, and colors. 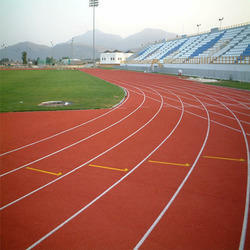 The Pre Fabricated Running Track surfaces are globally recognized. The rubber mat is primarily made of natural rubber and in two layers. The upper layer is harder than the lower layer and the elasticity of each layer is different. The top surface is molded with irregular convex lines while the back has a waffle-like a pattern forming 8400 concave air cushions per square meter of the track. The surface has excellent anti-slip, elasticity, and shock absorbing properties which makes the players less susceptible to pain. Both the top and the bottom layer is vulcanized at high temperature after calendaring and embossing on both the sides. This ensures that the top and bottom layers become bonded together and there is no split between the two. Asian produces high-quality Athletic Running Track systems. Asian Track systems are suitable for both competitions as well as for recreational and training purposes. The availability of a wide range of different Athletic Systems (Sandwich & Spray systems) ensures that you can install the best running track solution for every situation. 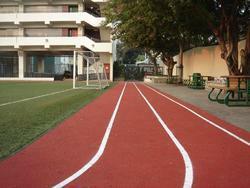 Our athletic tracks are produced in accordance with IAAF and EN 14877 standards for outdoor sports grounds. IAAF certified all weather and impermeable athletic track system. 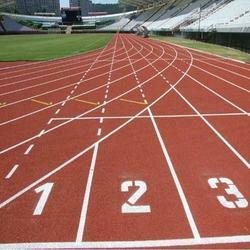 We are the manufacturer of stylish and beautiful Athletic Track Flooring. Our offered flooring is available in a variety of specifications and customized options.